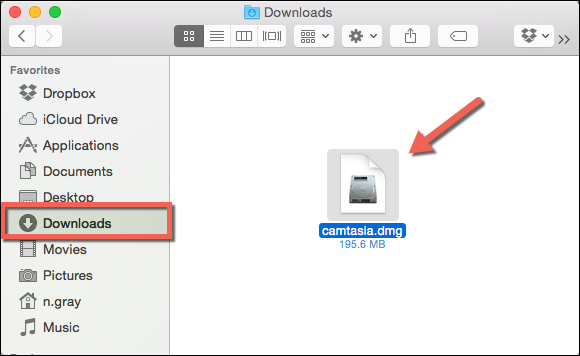 How do I install Camtasia (Mac)? Download camtasia.dmg after purchasing or from here. In most cases, the DMG file is located in the Downloads folder. Open Finder and select Go > Downloads. Double-click the camtasia.dmg file to open the installer. The installer window appears. Drag the Camtasia icon into the Applications folder. In Finder, click the Eject icon. To open Camtasia, double-click Camtasia in the Applications folder. If you receive the following error message, see this article.